New World of Warcraft Races, 'Cataclysm' Expansion Leaked? Werewolves and goblins and cats-out-of-the-bag oh my, a World of Warcraft fansite is dishing rumors on Blizzard's next expansion to its massively successful online roleplaying game. 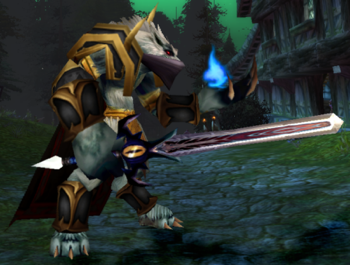 Skeptical Raybans at the ready, WoW.com claims the new expansion will be titled World of Warcraft: Cataclysm, and that its two new playable races will be Worgen (werewolves) and Goblins, stepping in for Alliance and Horde factions respectively. Both races already factor in the game's virtual-verse, but aren't playable. Blizzcon 2009 is right around the corner, August 21-22, so it's about time the tittle started tattling. But is Blizzard leaking false positives? Could be. They've certainly done it before. As for the hypothetical race picks, werewolves could be all kinds of fun. But goblins? Really Blizzard?